The Jungfrau Ski Region in Switzerland may not be the biggest ski area in the world, but it's probably the most picturesque. Comprised of 3 ski areas: Grindelwald-First, Murren-Schilthorn and Kleine Scheidegg-Mannlichen, it's primarily accessed by three grand old resorts - Grindelwald, Wengen and Murren, although the likes of Lauterbrunnen and Interlaken are quite handily placed if you're looking to ski in more than one of the areas and want to save a bit of money on accommodation. Below you'll find Information on the Swiss ski area of Jungfrau Region, including links to the surrounding resorts, webcams, slope information, lift details etc. Detailed review of the Swiss ski resort of Grindelwald. Includes detail on the slopes, the town itself, all the links you need, and some useful local knowledge. Detailed review of the Swiss ski resort of Lauterbrunnen. Includes detail on the slopes, the town itself, all the links you need, and some useful local knowledge. Detailed review of the Swiss ski resort of Murren. Includes detail on the slopes, the town itself, all the links you need, and some useful local knowledge. Detailed review of the Swiss ski resort of Wengen. Includes detail on the slopes, the town itself, all the links you need, and some useful local knowledge. The Schilthorn ski area on the slopes above Murren can be split into roughly 4 sub areas: Schilthorn-Birg-Obere Hubel, Allmendhubel, Maulerhubel-Winteregg and the Schiltgrat-Gimmeln area. The Schilthorn-Birg-Obere Hubel area is accessed by the Schilthornbahn cable car from the centre of the resort. The cable car actually comes up from Gimmelwald down below Murren, and then up to Birg and then beyond to the famous revolving restaurant on the top of the Schilthorn. This is the highest lift in the Schilthorn area, and just below this is the starting point of the famous Inferno run. For those skiers looking to access the pistes around the Allmendhubel area, the easiest way to get there is to take the Allmendhubelbahn funicular, which is located in the resort, roughly halfway between the railway station and the Schilthornbahn cable car station. The Maulerhubel-Winteregg area is probably the trickiest place out of the four to get to for those staying in Murren. You've got to come at it from either halfway down the red pistes at Allmendhubel and then get on the Maulerhubel chairlift or get the chairlift up from Winteregg, which is the first stop on the Lauterbrunnen-Murren train. To get to the slopes of the Schiltgrat-Gimmeln area, use the Schiltgrat chairlift from the village - it's just a bit further on from the Schilthornbahn cable-car. First is Grindelwald's best known ski area and is situated at 2168m and with views straight over to the Eiger. You get access to the First ski area via the gondola from Grindelwald, with mid-stations at Bort and Schrekfeld. As with most ski areas that require a single main lift to get you to the main area, it can be a bit of a bottleneck in really busy times, but the lifts are quite fast and the situation is much improved from the slower lift system that was previously installed. First is home to Grindelwald's main nursery slopes and beginners area. There's a chairlift to take you up to the Oberjoch ski area and a series of lifts over at the Schrekfeld and Bargelegg areas to allow you to access the slopes over in these sub areas. Given Wengen's location on the shelf above the valley, and with the sheer face of Mannlichen dominating over the village centre, it's no real surprise that to ski in Wengen you need to get yourself up and out of the village to get access to the main areas of slopes up at Mannlichen and Kleine Scheidegg. There are pistes that come back down to the village, following a route close to the world-famous Lauberhorn World Cup downhill course (don't panic timid skiers, there are alternative blue pistes alongside the world cup run). However, there's no real variation for the ski home, as this is the only route, but it's an extremely scenic home run and a lovely way to end the day. So apart from that route home and a small nursery slope area in the village centre, the main thing to realise about Wengen is that you need to get out of the resort centre to either Mannlichen or Kleine Scheidegg. Mannlichen is the mountain (height 2343m) that hangs directly over Wengen, there's a cable car station in the centre of the village called the Luftseilbahn Wengen-Mannlichen and it takes about 5 mins to travel up there. Be warned though that at peak times this can act as a bottle neck because it's the only direct way up to Mannlichen, so it obviously gets busy. So here's the trick - if you can get yourself out of the hotel and to the cable car before 9.15 you won't have to queue, even during the busy high-season periods, and can be skiing less than 10 minutes later. The other way to get out of town and onto the higher slopes is to take the train up to Kleine Scheidegg. This is the same line that carries everyone up to Wengen from Lauterbrunnen - it carries on up to Kleine Scheidegg and then further on to the Jungfraujoch (no pistes up there, so don't try it !). The train takes longer than the Mannlichen cable-car (about half an hour as opposed to 5 minutes), and it can also get very busy (it will also have passengers on the train already as its coming from Lauterbrunnen below) but it's a decent alternative if it's windy or if anyone's nervous of long cable-car rides ! Once you've got yourself up to either Mannlichen or Kleine Scheidegg, the first thing that's going to hit you is the view, be prepared for it. Whilst Wengen may not have the most extensive range of pistes, it does have something very special - scenery to die for... the Eiger, Monch, Jungfrau hanging over you, the Wetterhorn over Grindelwald and the Schilthorn over Murren. It's breathtaking stuff. The Jungfrau Ski region is comprised of 3 ski areas: Grindelwald-First, Murren-Schilthorn and Kleine Scheidegg-Mannlichen. The easiest way to get to the Allmendhubel area from Murren village is to take the Allmendhubelbahn funicular. From here there's a nice easy blue (number 6) that takes you right back down to the foot of the funicular. It's got snow cannons on it as well, so the coverage is usually ok. Red 7 follows a similar route down, albeit a bit trickier for early intermediates, and connects into blue 6 towards the end. On the other side of the Allmendhubel area is a couple of short blue runs with a drag lift. A nice long red (no 5) comes down through the trees on this side too and ends up at the bottom of the funicular. There are a couple of lifts on red 5 as well - the Allmiboden chairlift connects you back up to Allmendhubel whilst Maulerhubel chairlift takes you to the top of the Maulerhubel-Winteregg area. This area is the hardest to access from Murren village, you've got to come at it from either halfway down red pistes no 5 at Allmendhubel and then get the Maulerhubel chairlift up or get the chairlift up from Winteregg, which is the first stop on the Lauterbrunnen-Murren train. Beginners and early intermediates will find it's worth the effort because once you've got there are a couple of blues down to the base of the Maulerhubel chair and a lovely blue and red that goes in the opposite direction down to Winteregg. From Winteregg there's actually a red (no 3) that goes right down to Lauterbrunnen - this is the final section of the inferno run, so you can amuse yourself by skiing it flat out and pretending your charging to ski-race glory! Remember this is below 800m so there's no guarantee there'll be enough snow down at this level. From Mannlichen there is a blue (piste 2) or a red (number 3) to take you right down down to the base of the Mannlichen chairlift (note - that's the chairlift, not the cable-car back down to Wengen, you wont be skiing down that way unless you're about the same level as Candide Thovex). There are also 2 sections at the top where you can ski black piste no. 1 and then get down via the aforementioned reds or blues. One thing worth pointing out is that some of the higher slopes around Mannlichen can sometimes be closed due to high winds - it's quite an exposed area. Wengen village centre sometimes get's protected from the winds from the other side of Mannlichen but it's worth being aware that the conditions on the top run can be very different. However, this is a problem common to many ski resorts, not just Wengen. Also going down from Mannlichen top station is the Grindelwald Grund - Mannlichen gondola. The gondola goes from 2230m right down to Grund at 944m. There are a variety of blues and red pistes to navigate down to the bottom of the fantastically named Lager chairlift (not as good as it sounds!) but to get down further to the Holenstein station of the gondola or right down to the bottom at Grund early intermediates need to be able to get down a red run (piste number 3). Be aware that in busy holiday periods such as half-term the routes down to Grund can get busy before lunch as lots of people head down there (anyone skipping lunch or stopping earlier/later will find the runs down to Grund much quieter over lunch). There are a number of pistes between Mannlichen and Kleinne Scheidegg but the vast majority are reds and suited to intermediates. One thing we're too keen about in this area is some of the piste markings - which were were a bit unclear. Red pistes no. 7 at Tschuggen and no. 21 at Honegg or Kleine Scheidegg both meet up just below the Tschuggen drag lift and then take you down to Grund. Speaking of the Tshuggen drag lift - it's extremely long - worth bearing in mind if you've got kids with you who have a tendency to fall off them if they need to hold on for longer than 2 minutes !! Nervy intermediates or developing beginners can get down to Grund avoiding the reds if they want to by using the long blue piste (no. 22) that goes right down under the north face of the Eiger from Kleine Scheidegg, past Alpiglen and down into Grindelwald. There are a couple of reds up on the top of the Lauberhorn, and you can ski the World Cup run that starts up here and winds it's way back down to Wengen. It's the oldest race on the downhill circuit and also the longest, the pro's doing it in a staggering 2 and a half minutes ! There's a cracking bar up here called the Start Bar, if you're there when the Lauberhorn race is on then get yourself up to it, you'll be amazed that you can rub shoulders with the racers before they hurtle off down the course. If you're up on the Lauberhorn and look onto the opposite side of Kleine Scheidegg you'll see another area at a similar height - the Eigergletscher. More advanced skiers will be pleased to hear that there are a few black runs up here around the Fallboden lift as well as a couple of reds. You can get back down to Wengen from either the Eigergletscher, Lauberhorn or Kleine Scheidegg areas (with the latter having the blue option) but all 3 routes (with the exception of the black World Cup run) eventually end up at the Wengernalp area, sweeping round the corner on a steady blue to Allmend. If you do come down the World Cup run look out for boards detailing the different sections and jumps of the course. If you like your Ski Sunday or Eurosport then you'll recognise the names, if not they're still worth taking a breather at and reading. There are a couple more black and red runs in the Allmend area, ending down at the foot of the Innerwengen chairlift, one of the blacks is the Mannlichen World Cup slalom run, which traditionally takes place the day after the downhill. Back up at Allmend the blue run continues back down into the village - you can then make your way back over to the cable car and start again or if it's the end of the day head for a well-deserved drink ! We'll start with First, Grindelwald's best known area situated at 2168m and with views straight over to the Eiger. You get access to it via the gondola from Grindelwald, with mid-stations at Bort and Schrekfeld. First is home to Grindelwald's main nursery slopes and beginners area. There's a chairlift to take you up to the Oberjoch area. Slopes down from First consist of a blue (no 3) and a red (no 4) that lead down to Schrekfeld. For advanced skiers there's a black (no 5) that winds all the way down to Bort. Access up to Oberjoch, the highest lift-served point on this side of Grindelwald, is via a chairlift from First. There are then two runs back down to the base of the chairlift, an easy blue and a slightly trickier red. As well as the pistes down from the First area there is a chairlift (named Schilt) that you can get on and a few runs lead down from it - blue no. 8 and red no. 9 both end up back in the Schrekfeld area whilst another beginner-friendly blue takes you right down to the Bargelegg area. Advanced skiers can skip a long section of this blue by opting for a black (no 14) that runs in parallel to it. Going back to the main Schrekfeld area, there are 2 blacks and a red that run down from it - red 7 and black 16 take you down to the base of the Grindel chairlift at the Bargelegg area whilst black no 6 runs right down to Bort, its a long black that'll really get those thighs burning with a vertical drop of about 400m. Piste-map of the Mannlichen and Kleine Scheidegg ski areas above Wengen. Piste-map of the First ski area above Grindelwald. Piste-map of the Schilthorn ski area above Murren. First webcam - the cable car station above Grindelwald at 2168m. Hotel Eiger webcam - in Murren village. Mannlichen webcam - the cable car station above Wengen at 2230m. 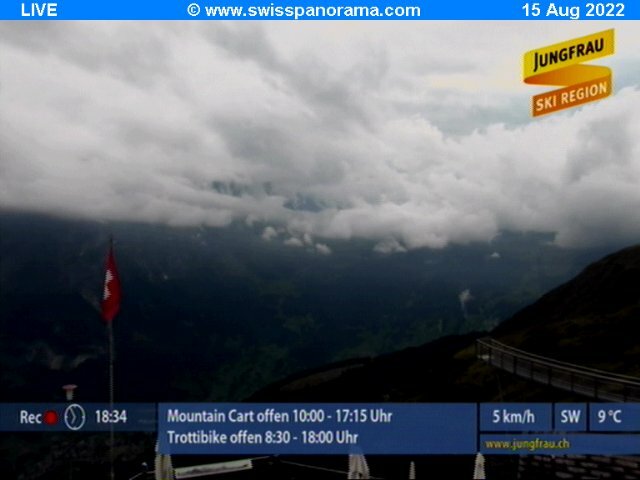 Wengen webcam - from the town centre. Kleine Scheidegg webcam - train station facing north face of the Eiger. Lauberhorn Hundschopf Jump webcam - world-famous section of the world cup downhill race. Lauberhorn Race finish area webcam - of the Wengen FIS World Cup downhill ski race. 2014: For the 2014-15 season the Schilthorn area has new lifts at Gimmeln and Allmendhubel. 2014: For the 2014-15 season, also up at Schilthorn, there is the new Skyline Snowpark. 2014: For the 2014-15 season, a new Half-pipe has been created at the White Elements Park at Grindelwald-First. 2012: For the 2012-13 season the Wixi chairlift will be replaced by a 6-seater chairlift with weather-protection hoods. 2012: For the 2012-13 season the ski-pass price will stay the same as the 2011-12 season. 2012: Anyone purchasing a Jungfrau Ski Region ski-pass of at least 6 consecutive days will be able to receive a free 1 day ski pass for the Zermatt Ski Region. 2012: Anyone holding a valid Jungfrau Ski Region ski-pass will be able to use the First Flyer ride free of charge.